I came across this Ted Talk while spending a normal work day researching body image and the impact it has on our sense of self-worth, our relationships, and ultimately how we show up to life each day. Back in 2006, at just 17 years old, I moved down to California. After an attempt at city college, I ended up modeling and acting in Los Angeles. Coming from my background as a homeschooled gal from Orcas Island, this was quite an extreme. I always loved challenges! But oh wow, I was not prepared for the challenge ahead. Perhaps you are wondering what would have taken a small town girl raised in such a rural and alternative manner to move to LA and pursue a career in print modeling. Well, here’s a little backstory; from the moment I was born, I dealt with confusion about my physical appearance. Simply because I was in a female body, my father didn’t know how to love me and he put his focus on my brothers. I was considered a “challenge” and something he didn’t know how to interrelate with, other than telling me I should wear long skirts, have long hair, and other religious-based ideas of gender roles. And all the while, at a very young age, I started getting unwanted attention for my physical appearance. I would be holding my mom’s hand and walking into the post office or the grocery store, and within moments someone might comment “oh, Susan, your daughter is so beautiful!” You may think that hearing “honey, you should be a model!” would be a compliment at any age. But instead, I grew up feeling that my most valuable asset was my appearance, something that is impermanent, ever-changing and conveys no measure of my character or of the person I am inside. Fast forward to barely-of-adult age and living in the dense city of LA. During the brief 9 months I committed to the fashion and advertisement industry, what I experienced first hand about our media, the cultural standard of beauty, and the impact it has on our overall self-worth was exponential. I watched photographers Photoshop away my hips, add size to my breasts, add volume to my hair, change the shape of my nose, and take away all my freckles, scars and even pores! I was encouraged to diet, to count calories, cut my meals in half and even try cigarettes and cocaine for appetite suppression. I can’t remember a day that went by that I wasn’t told to lose another 5 pounds. No weight, no size was ever enough. After I started practicing yoga, the ways in which I thought my body was wrong and unlovable, slowly began to heal. I was studying to achieve my BA in Human Development through Yoga at Prescott College, curating my senior thesis around body image and how yoga can heal this within us. Shortly thereafter, Embody Love Movement came into my life. What we learn through yoga is that our physical bodies are impermanent; they are born, they age and then they die. Change is the only constant. Nothing is permanent, especially our appearance. 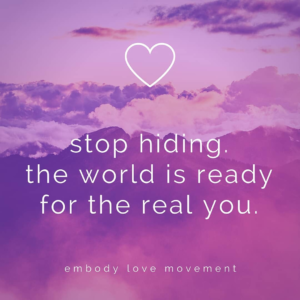 The international nonprofit, Embody Love Movement, is about celebrating inner beauty, committing to kindness and contributing to meaningful change-making in the world. 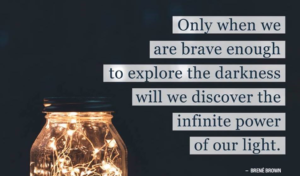 Through the curriculum developed by Dr. Melody Moore, clinical psychologist and yoga teacher, you are given an opportunity to witness yourself beyond your physical appearance. You come to realize how universal the feelings around body image are. The conversations are rich; the feelings of being seen, heard and understood are the definition of community. In the workshops that are provided through Embody Love Movement, you sit in circle with folks who remove the veil, share their vulnerability with courage and authenticity and come out the other end with words like: “This may have been the best thing I have done in my life.” (anonymous 12 year old) and “Not only was it a critical and transformative look inwards, but it also showed me how to project that love outwards, to all my fellow humans. Embody Love Movement honestly granted me one of the greatest gifts I’ve ever been given.” Zoe Kromer, 20 year old, now trained facilitator in the local area. This work is invaluable and can be extremely transformational. It is from my experience of hosting over 35 workshops, as well as training over 40 other facilitators in offering this work, that anyone can benefit from a conversation around body image, the impact media/social media has on our self worth, and how our perception of Self directly impacts how we show up in our relationships and the work we do. Whether it be for healing your heart, the influence you have upon your children, your students, or simply to share and uplift others who inevitably suffer from low self worth. With this new perspective comes new dialogue and a new way of being. How are we ever going to see our true value in this existence, our true purpose, talents, gifts and contributions, if we are fogged by an idea that we are already not “good enough” based on an ever changing aspect like appearance? Minta’s next Embody Love workshop is September 28th. Feel the power of transformation for yourself, and commit to a movement of kindness and love.